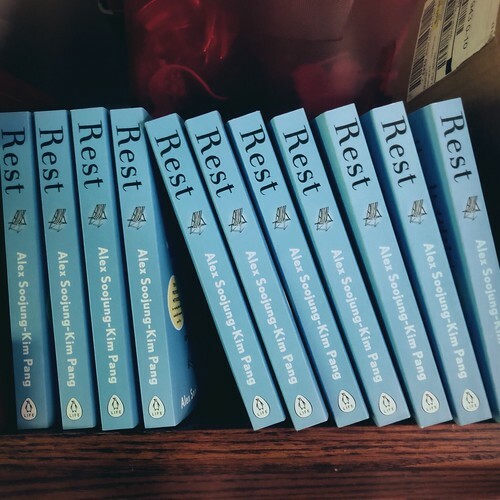 My UK publishers sent me a box of copies of the new paperback edition of REST (the one with the foreword by Arianna Huffington). One thing I’ve learned is that while it’s cool that they exist at all, and it’s cool to see a bunch of them all together, copies of your book don’t do you any good just sitting on your shelf. It’s like money: you want enough on hand in case you need, but in the long run you’ll be better off it it’s out in the world, circulating and being used. 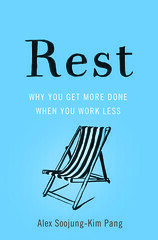 Rest is the same way. The books do more good when they’re out in the world, and seeing the world. So I’m giving some copies away. As you can see, I’ve added an unobtrusive newsletter signup at the top of the blog. I’m going to offer a copy a week to a randomly-selected newsletter subscriber, until I’ve put a dent in this pile. My one rule: because the cost of shipping books internationally is ridiculous, I’ll send books within the US only. (I’m not made of money, alas!) So if you live outside the States, sorry; but maybe you have an American friend? In the future, I’ll probably also offer subscribers an early look at the next book, as well as other works-in-progress type things. More reasons to subscribe! * Disappointed, that is, at how little you’re able to get for it. It’s really it’s not worth going through all the work of listing it, dealing with going to the post office, etc. Just keep the book.